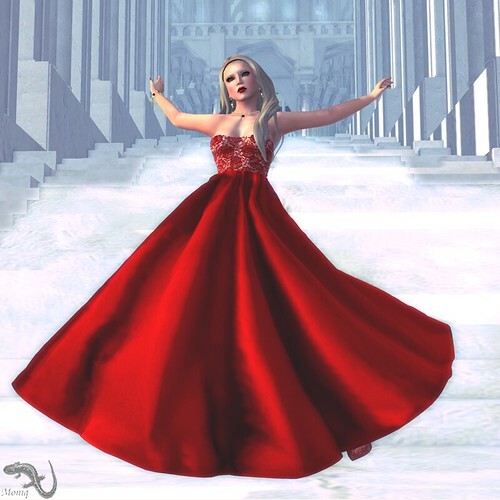 Through Salamander's eyes | Bits and pixels of Second Life fashion. And more. If you saw Moniq in-world these days (which is not likely, since she’s been hiding on her platform mostly), she was wearing this exact outfit. For a whole week! However, I want to show you these goodies before the event ends, on Jan.31, which is tomorrow, so you have a chance to grab them for a special price. The skin, hair and dress are available at the event. The jewelry set is not for my Attic, but it’s new and too beautiful to pass! Quick post to show you two looks that I made using some new releases and discount event items. Plus some gifts! I officially cancelled winter in my SL. I need sunshine, green trees, sunny streets. And that’s not impossible to find in a world where others love that as much as I do. I want to show you a lot of things that are new or not that new, but are gorgeous and work great together. First, I wanted to blog these Miamai shoes that were released for Shoetopia. I know that event ended a while ago, but I bought a lot of stuff that I didn’t get a chance to wear or blog so far. The shoes are add-on for SLink medium feet and will not work for the avatar feet. But hey, I am a fan of SLink add-ons and I know I’m not the only one. And then Cae released this lovely jewelry set for Fameshed. It includes two types of necklace, bracelets, earrings and rings, that can be bought together or separately, and you get a hud to change metal and stone colors. Also, I’ve been wearing this beautiful skin by PXL since last year 😀 It is the latest group gift and I think it is still available for VIP members. Another item that I love is the Calico hair on Moniq. It is a current hunt prize and has lots of options to customize it as you wish. While it’s more like RP hairstyle (the prize includes a headpiece too), I decided it gives a cool touch to the outfit. I wish you a happy Christmas, New Year and whatever other holiday you are celebrating. I’m not sure if I have time to blog again until next year. And now it’s time for new stuff, great stuff, free stuff, you name it! First, Mina is participating in this round’s Dressing Room Fusion with a hair with a beanie, in Ombre tones. These tones are quite in fashion and I wish they were more easy to do in RL too! Also, Maytreya has these gorgeous leggings at Collabor88, which I advise you to buy – if you didn’t already. Also, this coat is still available at the Arcade, so try your luck at the gacha machine. Plus, I found this amazing shoe store. I must have been living under a rock (and I have, quite a few months, due to RL stuff), but I just discovered Eudora. Great items, mostly ankle boots, all very fashionable and well done. Plus, for each purchase, you get a color pack instead of a single pair, and they are all very customizable. And there’s a group gift too! Speaking of group gifts: Belleza is wishing happy holidays to the group members with a lovely gift – and there are three skins or so in the present! And now on the nostalgic note, all sculpted items from COCO will vanish from the grid at the end of this year. Until then, you can get them for free. I know, mesh made us lazy, because it does not poke through and we don’t have to adjust every attachment over and over. But I am keeping some old sculpted stuff in my inventory because of memories. And COCO items were always good, so adding some more can only hurt my inventory. I’m talking about love for shoes, obviously. LaRoo released these amazing stilettos and I’m wearing them for days now! Ok, one of the reasons is that I had no time to blog them, but still, I don’t want to take them off! And because who knows when I can blog again, I made two looks for this post, with some new releases, some gifts and… guess what shoes I am wearing? Also, LaRoo has a photo contest to celebrate one year on the grid, so scroll down for details on how to enter! Anyway, this post is to show you some specials and some freebies, as lots of things are happening these days – hunts, events, advent calendars, you name it. Anyway, this post is to show you some goodies available at the Arcade, which opened on December 1st and which is still jam packed. Shopping from the nearby sims is always the way, trust me! Geeky with a twist. That’s how Moniq looks today. Also wearing gold/yellow, a rather unusual color for me in both lives. But I fell in love with those shoes by Boom available at Shoetopia (they are a donation item, so you only have until Saturday to get them), and I thought this dress was perfect for them. The dress is by Peqe for the Geeks and Nerds fair and it comes in several colors.